Are you always put big golden star in the top of your Christmas tree? It looks great but too usual. 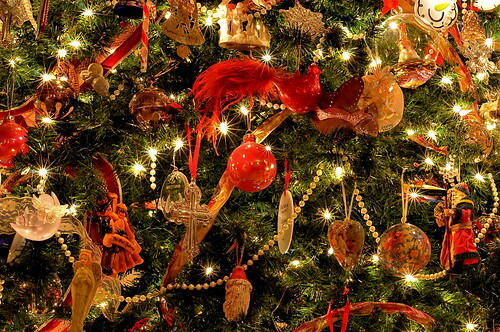 Try to change your Christmas tree decoration this year by placing several bells on the top of Christmas tree. Now you get unique and festive look! Try this one and you’ll surprise how it works. Use natural woven basket to get a classic beautiful scene in your living room. It’s totally okay to use old tree ornaments, better actually. You can decorate the tree with vintage look ornaments that your mom bought years ago or the one you found on grandma old trunk. Long cascading of colorful ribbons will be a great decoration for your Christmas tree. Attach ribbon directly to an embroidery hoop and then simply slide over the top of your tree. You can also add some pom-pom fringe or string of beads between two cascading ribbon.